And So It Goes opens in Australian cinemas on the 7th August and is distributed by Studiocanal. Opens in cinemas in the United States on the 24th July and now showing in the United Kingdom. 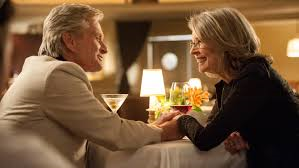 If Rob Reiner, Michael Douglas and Diane Keaton were to be given a school report card judging their work on And So It Goes, it would read the same on all of them....."Can Do Better". If this was the first piece of direction you had seen from Reiner and the first film starring Douglas or Keaton you had seen, you probably wouldn't want to see another. And So It Goes is overly stereotypical, ridiculously exaggerated and completely predictable. The film doesn't feel as if it was made with any love or passion, rather it was just made for the sake of making a movie. Realtor Oren Little (Michael Douglas) has had little compassion, time or respect for anyone since he lost the love of his life to cancer and disowned his addict son, Luke (Scott Shepherd). When Luke reappears to let his father know that he is going to jail, he also informs him that he has a ten year old daughter, Sarah (Sterling Jerins) who he needs Oren to look after while he is behind bars. Oren really has no desire to look after this little girl he knew nothing of, but his next door neighbour, Leah (Diane Keaton) is completely taken by Sarah and takes her under her wing while Oren figures himself out. Leah, who also struggles with the memory of the death of her husband, and Oren find that this little girl may be the one who helps both of them move on with their lives and ultimately find comfort in each other. And So It Goes is completely and utterly typical for the type of film which it is. There is nothing whatsoever original about it and originality seems to be substituted by over exaggeration of the stereotypical romantic comedy genre features of the film. 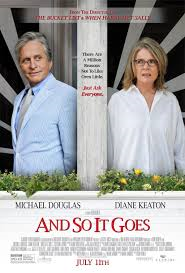 And So It Goes is exactly what you would expect from a comedy led by actors in the same generation as Michael Douglas and Diane Keaton. It is the lightest of light watches, even though it deals with highly emotional subjects such as death and substance abuse. It is an understatement to say that And So It Goes is not the best work of anyone involved. Rob Reiner's direction of his players is surprisingly mediocre considering what he has achieved in the past and doesn't support an already weak screenplay by Mark Andrus. Again, Andrus has written some wonderful screenplays in the past, including As Good As It Gets, which he was nominated for an Academy Award for. The screenplay leaves a great deal to be desired with certain situations leaving the audience scratching their heads in confusion. For example, why was Oren's co-worker Ted (Andy Karl) going to such great lengths to become friends with Oren's son when he clearly isn't that close to Oren anyway and why was messaging Luke on Facebook and texting him? Messages on Facebook and texting will typically give the same result. Plus neighbour, Kennedy (Yaya DaCosta Alafia) has the easiest home birth ever. With all these talented people attached, one has to wonder what really went wrong. The situations and characters in the film are wildly exaggerated which would normally point to the film makers trying too hard, but it is the exact opposite. The film just seems like it was made carelessly and without passion, like everyone just turned up for work and didn't particularly want to be there. The film begins well enough with a glorious long shot over the Connecticut riverside location where the film takes place, and there are actually some beautiful location shots throughout the film. The town where the characters live is certainly idyllic and looks wonderful on screen. Yet the musical score attached to these images is once again stereotypical for such a film and bordering on corny. The performances by those in the film are not all together terrible, but the way their characters are written and their direction does not give them a great deal to work with. Michael Douglas' Oren Little is an extremely unlikable character. He has his best and most empathetic moment in the last five minutes of the film, but the rest of the film see's his character taking the path so many cynical characters in film have taken many times before. His bitter dialogue is supposed to be funny, but comes across as just plain mean and often quite racist and sexist. Oren's character is constructed well as you feel you know his background in depth, but his development throughout the film is patchy and doesn't register on an emotional level the way it should. Diane Keaton's performance is extremely over the top. Again, it is not as much Keaton's fault as it is the way she is directed. The way Leah cries at the drop of the hat during the film seems neither funny nor upsetting, it is more just ridiculous. Her emotional outbursts are not emotionally exaggerated as they are physically exaggerated by the way she throws her arms in the air and raises her voice at appropriate moments. Again, her character of Leah is constructed well, but it is not clear at what stage in the film she really starts to change or whether she really changes at all. She doesn't represent a strong female character by any means. However, Sterling Jerins and Scott Shepherd give strong performances and the scenes which the two are in together are actually quite sweet and emotional. At such a young age, Jerins gives perhaps the most controlled performance out of anyone in the film and her character is the best written in terms of development. And So It Goes requires no emotional investment nor a great deal of brain power. It is unfortunately completely forgettable and a film which you get the feeling most involved would rather forget as well.